Boris Johnson, in his formal resignation speech to the British House of Commons, urged the Conservatives on Wednesday to abandon the "miserable permanent limbo of Chequers," referring to the nickname of the Theresa May plan to address Brexit concerns within her own party and the European Union. Boris Johnson, in his first public comments since resigning last week as Britain's foreign secretary, urged his party in the House of Commons on Wednesday to not abandon a hard Brexit approach while there's still time. "We have changed tack once, and we can change again," said Johnson. "We must try now, because we will not get another chance to get it right." Johnson said he was fully supportive of Prime Minister Theresa May in January 2017 when she laid out in an ambitious speech a desire to strike the right deal for Britain with the European Union after a majority of the public supported the break in a referendum months earlier. He referred to a "miserable permanent limbo of Chequers," a reference to the country residence of the prime minister, where she emerged earlier this month with a plan to go forward that sought to strike a balance of the desires from both the pro-Brexit and pro-EU wings of her party. Within three days of that party retreat, Johnson and the minister responsible for Brexit negotiations with the EU, David Davis, resigned from their cabinet posts. It brought the total of resignations from the May government in the last seven months, for various reasons, to seven. May said Wednesday that talks had already started with Brussels based on the proposal set down in a white paper policy document earlier this month. "The Chequers agreement, the white paper are the basis for our negotiation with the European Union and we have already started those negotiations," she told Parliament. May said her government has begun negotiations with the European Union based on her hard-won Brexit plan and that there was still enough time to negotiate a Brexit deal with Brussels before Britain leaves the EU in March 2019. In Johnson's view, the government has ceded too much authority to Brussels, pointing specifically to a €40 billion ($61.6 billion Cdn) exit bill Britain agreed to with the EU. "We dithered and burned through our negotiating capital," he said. Asked by the head of a parliamentary committee whether she would warn the public about the consequences of a "no deal" Brexit, May answered: "You have based your question on an assumption that said we were getting closer to a no deal scenario. I don't believe that is the case. We have put forward a proposal for what the future relationship should be ... and we are in negotiations on the basis of that." She added that the government would release around 70 "technical notifications to set out what UK citizens and businesses need to do in a no-deal scenario" in August and September this year. May won votes on a customs and a trade bill in Parliament earlier this week, but suffered an unexpected defeat on a separate amendment, which means her government must now seek continued participation in the European medicines regulatory framework. 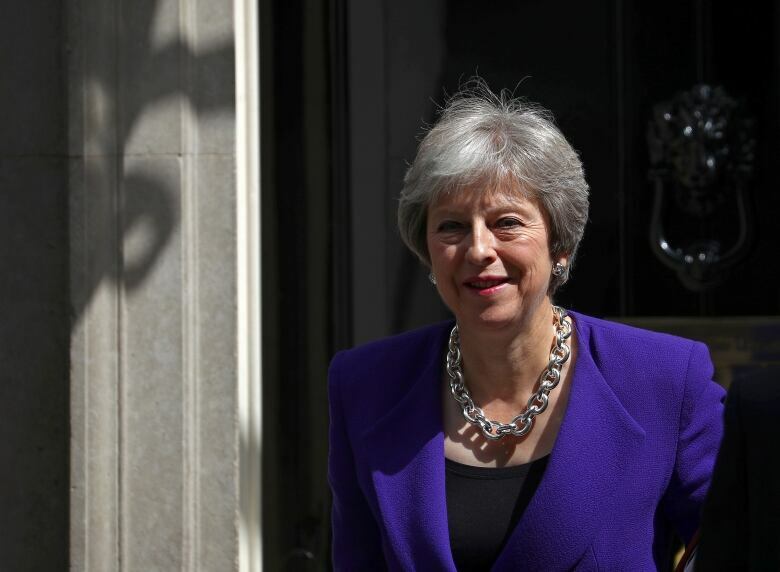 "What should have become clear to [May] is that the Chequers proposals are completely untenable with our [party] membership in the country and the electorate," Andrew Bridgen, a Conservative pro-Brexit lawmaker, told Reuters. "My advice is to drop it now before it causes further damage to our party's reputation and polling numbers." It remains to be seen how far those challengers within the party are willing to go to assert their point, as the opposition Labour Party comes out ahead in most general approval ratings. While May's party continues to be divided by her desire for a "business-friendly" departure, EU member Ireland also said it was focusing on the white paper, unwilling to be diverted over the changes to her Brexit plans forced through in Parliament this week. "If we get distracted by individual amendments to individual pieces of legislation ... then I think we get dragged into an unnecessary debate that wastes a lot of time and energy," Foreign Minister Simon Coveney told Ireland's state broadcaster RTE. Johnson, to a chorus of "hear, hear" that required the Speaker to issue a warning, said the Northern Ireland border issue had become "so politically charged as to dominate the debate."